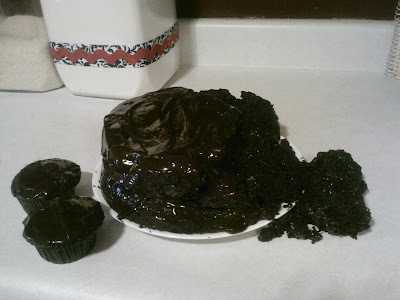 Author Gail Wagner: Chocolate Success...Cake Failure? So here is a picture of my first from scratch cake. I must say it tasted divine! Not too sweet, perfectly moist. I don't know if you noticed...it kind of fell apart. Yeah...so that was my fault. The directions clearly stated to spray the cake pan and line with parchment. I didn't. I thought spraying would be enough. It wasn't. I did change one small thing. I don't drink coffee so I used Pero instead. It's a roasted barley coffee substitute. I just made it up extra strong. Despite the mishap, it is definitely going in the "to make again" pile. I got the recipe from Emily over at Paperseed. Click here to see it...as well as how beautiful hers turned out. Hmm...maybe I should have been more specific: make a cake from scratch that looks as good as it tastes. I may have to try a few more times. Darn! Good thing I have several friends that like chocolate! You may find me on your door step with cupcakes in hand. Once again excuse the poor photo. A decent camera is on my wish list. Till then it's my trusty phone, but in its defense this was taken in the kitchen of our rental which has TERRIBLE lighting! Anyhoo. Check one off my list! Maybe I should have put something on it about learning to take decent photos. That's a thought.